Gardner and his bill drew immediate criticism from opponents of marijuana legalization. While opponents called the proposed legislation irresponsible and dangerous, Gardner said it was a matter of 10th Amendment states’ rights. 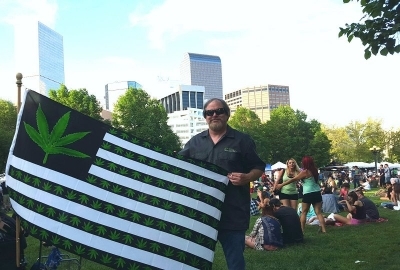 Gardner referred to the 2012 state ballot measure in Colorado that legalized recreational marijuana sales and use, criticizing federal laws that continue to classify marijuana as an illegal drug that could lead to felony convictions even when state law allows it. “Because of the one-size-fits-all federal prohibition, state decisions like this put Colorado and other states at odds with the federal government,” Gardner said. In the past year, Michigan, Missouri, Oklahoma, Utah and Vermont increased the number of states to 47 that have legalized at least some uses of marijuana. Gardner reintroduced the bill on the same day the New Hampshire House of Representatives passed a bill by a 200-to-163 vote that would commercialize the sale of recreational marijuana. The Justice Department initially tolerated states’ efforts to legalize marijuana. But last year it withdrew the support amid outcries from opponents about health and safety concerns. The outcries continued Thursday from the public policy group Smart Approaches to Marijuana. ”Make no mistake, this bill formally legalizes marijuana at the federal level,” said Kevin Sabet, president of the Alexandria, Va.-based Smart Approaches to Marijuana Action. Other dangers come from corporations that could advertise marijuana sales, sometimes making it more available to vulnerable children, Sabet said. He added that proposals like Gardner’s would encourage organized crime to enter the industry, such as through illegal imports of marijuana into U.S. mainstream markets. “Many Coloradans are deeply embarrassed that Senator Gardner has become a champion of the increased cartel and black-market activity that is harming other states,” Sabet said. Gardner did not directly address his critics but instead focused on the rights of state residents to make their own decisions. “The bipartisan, common-sense bill ensures the federal government will respect the will of the voters — whether that is legalization or prohibition — and not interfere in any state’s legal marijuana industry,” Gardner said in a statement. The bill is called the Tenth Amendment Through Entrusting States Act (STATES Act). Sen. Elizabeth Warren, D-Mass., joined Gardner in introducing it in the Senate. Colorado Democratic U.S. Sen. Michael Bennet is a co-sponsor. Key provisions of the bill would amend the federal Controlled Substances Act to protect persons from criminal liability if they comply with state or tribal laws on manufacturing, production, possession, distribution and delivery of marijuana. They would not be protected from federal prosecution if they employ minors in marijuana operations or endanger human life while manufacturing it. Other provisions ban sales to anyone less than 21 years old except for those with medical conditions. Distribution of pot would be prohibited at transportation safety facilities such as truck stops.